For me, manicure inspiration can come from so many places. My manicure is my way of showing how I’m feeling, following trends, and expressing myself. Sometimes I tie it into current events, holidays, or even what I’m wearing. The inspiration behind this week’s manicure? Fashion. For Thanksgiving this year, I wore a black and white striped dress with a black and gold bib necklace. I was really into the black and gold theme and wanted to carry it through to my manicure. I turned to my trusty Nail Art Society kit to create the perfect holiday manicure. This manicure features OPI’s Goldeneye Nail Lacquer from the Skyfall Collection, a beautiful, shimmering gold. After my base coat (Nail Tek II), I applied three coats of Goldeneye to each nail except for my ring finger until it was completely opaque. I finished these nails off with Essie’s Good to Go. The accent nail was really the guiding force for this manicure – I’m totally on the nail stud train. To create the accent nail, I applied two coats of Jessica Custom Nail Colour in Black Matte. After letting these nails dry completely (it’s much easier to handle nail studs when your nails are dry), I applied gold nail studs in a diamond shape. 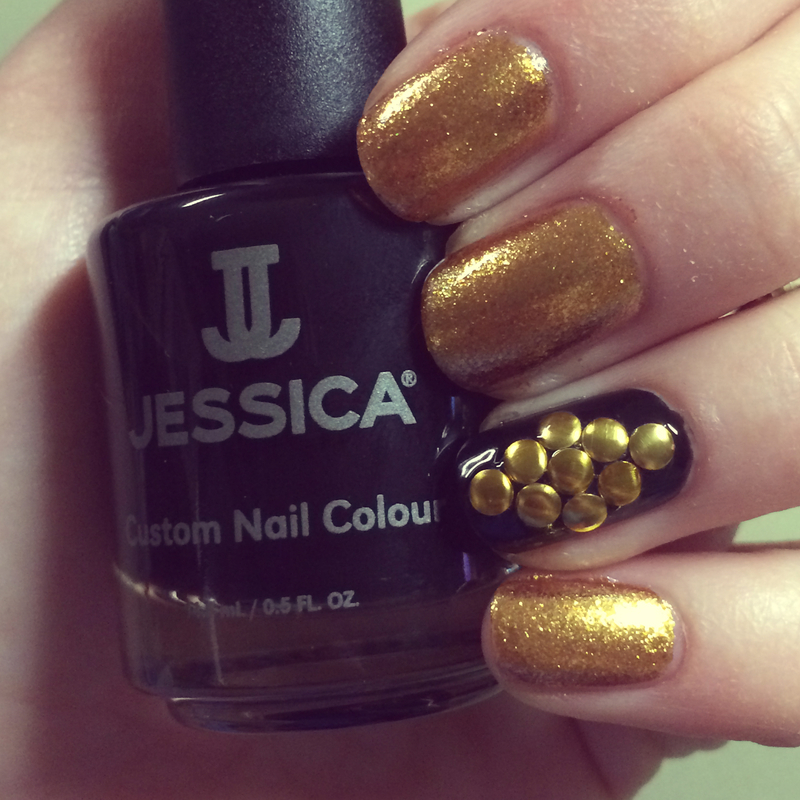 To learn how to apply nail studs, click here. I sealed the studs in and finished the look with NYC’s Matte Me Crazy Mattifying Top Coat. Share your #ManicureMonday with us on Twitter @Collaboreight!